The gift accompanying this card is a pair of concert tickets, so I've tried to incorporate that into the design. Click on the picture to see it bigger and you'll see the details. It's a bit bigger than usual - it fits in those envelopes you use for an A4 paper folded in half. I might have used the reverse side of this BG Origins paper for a less busy look, but I liked this side for its brightness. I've stamped a music sheet background stamp in Forest Green StazOn on some adhesive canvas and distressed it using brown chalk ink and by tearing away some fibres along the edge. Over that I've attatched a trimmed 7Gypsies overlay decorated with notes. 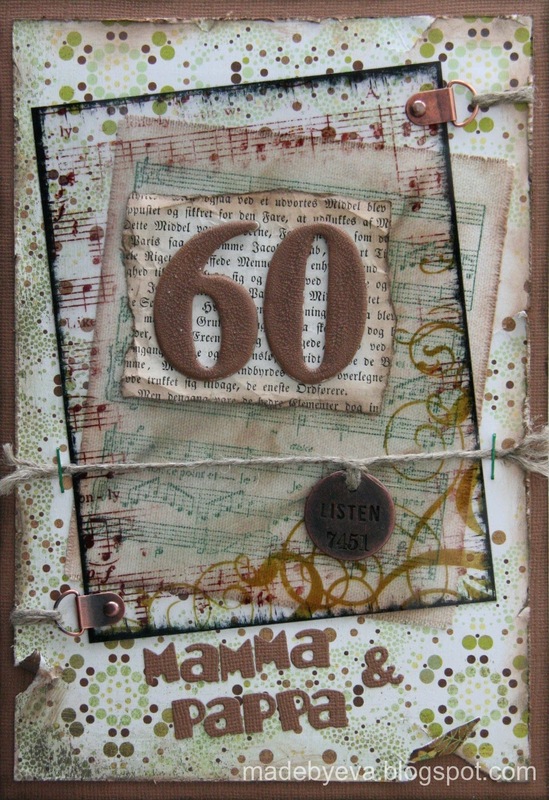 The Prima chipboard numbers are painted with CracklePaint and mounted on a piece from an old book page. 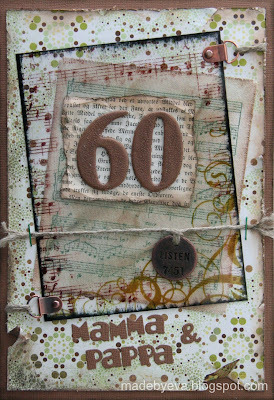 Some QK Moxie letters, a Tim Holtz medallion and a few other pieces of hardware and the whole thing was done!